Rome attraction-guides.com - Rome, Italy attractions guide Rome Spanish Steps (Scalinata di Spagna) information about attractions, nearby Spanish Embassy building, history, Pope Innocent XIII by Francesco De Sanctis, spring flowers, location and address, general tourist information about Spanish Steps (Scalinata di Spagna) in Rome (Roma) area, Italy (Italia) IT - Last updated 30/10/2012. 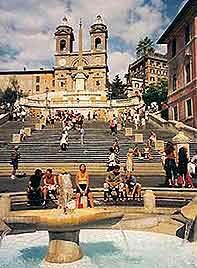 Rome's Spanish Steps (Scalinata di Spagna) are widely considered to be one of the most delightful and stunning settings of the baroque period. The spectacular staircase was originally constructed in 1723 and the Spanish Steps (Scalinata di Spagna) are named after the nearby Spanish Embassy building, which still remains the headquarters of Spain's Embassy to the Holy See. The Spanish Steps (Scalinata di Spagna) were built at the request of Rome's Pope Innocent XIII by Francesco De Sanctis, and every year in spring large and colourful pots of flowering azaleas provide a spectacular display on the steps.